I felt autumn today. It was the first time this year I’ve felt that chill, dampness in the air that signals the changing seasons. Even though it’s a bit depressing – I’m not quite ready to concede that summer is over – it’s a great excuse to cook up some comfort food. And what’s more comforting than hot, sticky, bubbling fruit, topped with crispy, crunchy golden crumble? Just the word ‘crumble’ is a comfort: the smell of crumble cooking reminds me of home. Luckily, it’s also a doddle to make, especially if you’ve got blackberries growing in your garden/local park/neighbour’s hedge. For the first time in a long time, I’m living in a house with a proper garden. 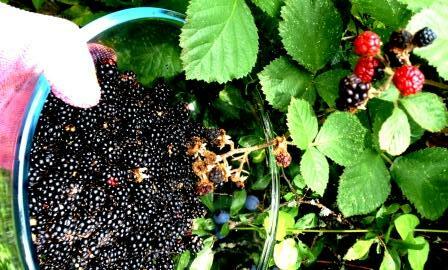 We’ve let it run a bit wild over the summer, which means that the blackberry brambles are EVERYWHERE. Kerching! I made this crumble with fruit I picked from our garden, which is a whole new level of excitement for me. If you don’t have access to any nearby fruit trees, don’t despair – it’ll taste just as good! Preheat the oven to about 170˚C. Melt the butter in a pan over a low heat, then add the sugar. Stir together until the sugar has dissolved and the mixture is caramel-coloured. Add the apples to the pan, and allow to cook for about 5 minutes, until the apples are just softened. Then add the blackberries and the cinnamon, and allow to cook for another 5 minutes. Meanwhile, rub the flour and sugar into the butter. Next, add the oats and the cinnamon and continue to rub through your fingers until the mixture reaches the texture of rough breadcrumbs. 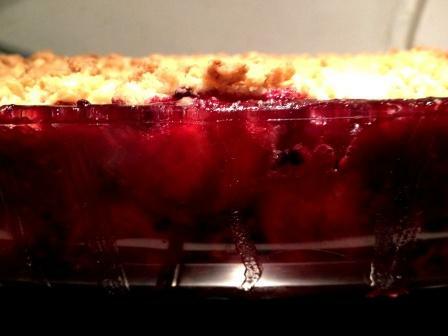 Pour the fruit mixture into a shallow oven-proof dish, then sprinkle over the crumble. Put into the oven and cook until the crumble turns golden-coloured.